L-R: Adrian Baidoo and Ross Birdsong in SEPARATE AND EQUAL. Photo by Jeff Hanson. 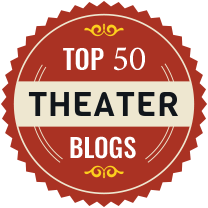 Currently premiering at 59E59 Theaters in midtown Manhattan, Separate and Equal is a powerful, provocative, and timely play that addresses the issue of America’s racist history with considerable insight and unusual creativity. Written and directed by Seth Panitch, the play was produced by the University of Alabama in partnership with the Birmingham Metro NAACP and the Birmingham Civil Rights Institute and was inspired by personal recollections from the Oral History Project at the Birmingham Civil Rights Museum. The play is set in Birmingham, Alabama in 1951, three years before the Warren Supreme Court handed down the Brown decision mandating school integration - and thereby overturning the holding of Plessey v. Ferguson which had established the concept of “separate but equal” as the law of the land. 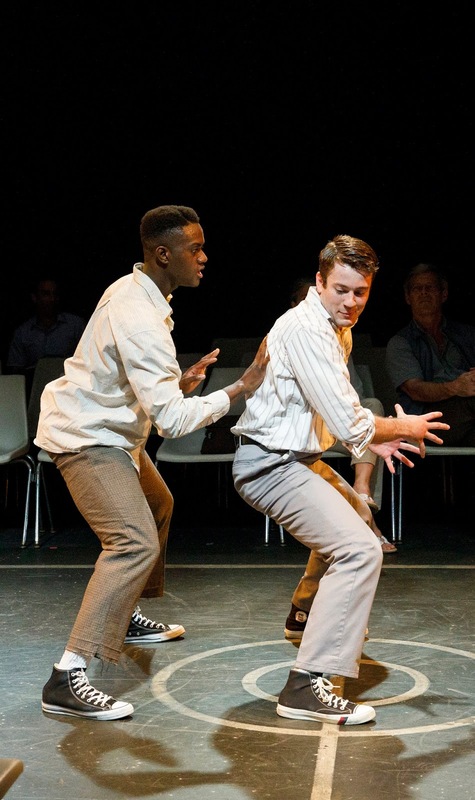 The play perfectly captures the essence of Jim Crow Alabama at that time through the medium of a series of basketball games played by six teenagers – three white and three black – struggling to deal with its constraints. The set for Separate and Equal is designed to simulate a basketball court, one that is reserved for whites during most of the week and is only supposed to be used by blacks on Sundays. Today, however, when three black teenagers – Calvin (Adrian Baidoo), Emmett (James Holloway) and Nathan (Edwin Brown III) – show up, it is only Wednesday. Presumably, though, any white teenagers who might have wanted to use the court are all in school, so what can be the harm if…. Except for the fact that three white teenagers – Edgar (Ross Birdsong), Jeff (Steven Bono Jr.), and Wesley (Dylan Guy Davis) - have chosen this day to cut school and they show up too. The situation is fraught with risk but the teenagers manage to overcome it (at least superficially and for a while) in a manner superior to what their elders might have achieved. The older generation, after all, was so set in its ways that even the idea of a black teenager’s addressing a white teenager by his first name without attaching the honorific “Mister” was difficult to accept. Certainly Edgar’s mother, Annabelle (Barbra Wengerd) and Calvin’s mother, Viola (Pamela Afesi) – who worked for Annabelle – were uncomfortable with it. Separate and Equal can be enjoyed and appreciated on many levels. It is a first-rate depiction of the relationships between whites and blacks in Jim Crow Alabama in the 1950s – not only relationships of teenagers with one another but also relationships with black elders such as Two Snakes (Will Badgett) and with police officers such as Lt. Connor (Ted Barton) and Lt. Dixx (Jeremy Cox). It is also a brilliantly choreographed rendition of a basketball game that I found enthralling. And the playing out of the basketball games, which are at the very center of the play, turn out to be a wonderful metaphor for the evolution of race relations in this country over the last century. The Anderson twins at SONGBOOK SUMMIT. 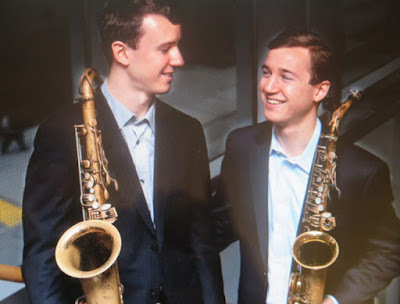 This year’s four weeks’ production of Songbook Summit at Symphony Space, featuring Peter and Will Anderson on saxophones, clarinet and flute, has come to a close with a tribute to the life and works of Jimmy Van Heusen, Frank Sinatra’s good friend and go-to songwriter. In the first three weeks of the 2018 Songbook Summit production, the Anderson twins, supported by Tardo Hammer on piano, Clovis Nicolas on acoustic bass, Philip Stewart on drums, and Molly Ryan on vocals, played the songs of Irving Berlin, Jerome Kern and Hoagy Carmichael,. All of those programs featured musical arrangements by Peter and narratives by Will, together with a wide array of historical film clips and drawings from the Al Hirschfield archives and all three programs were enormously entertaining (see our recent posts on all three programs). It is not at all surprising, then, that the final week’s program, devoted to Van Heusen and staged in a similar format, was equally entertaining. The Van Heusen name (which the composer assumed after seeing an advertisement for the shirt company!) may not be as recognizable as that of Berlin, Kern or Carmicahael, but perhaps it should be. Van Heusen was, after all, exceptionally prolific, having written 800 songs recorded by everyone from Ella Fitzgerald to Bette Midler, from Miles Davis to John Coltrane, from Peggy Lee to Doris Day, and from Bing Crosby to Frank Sinatra (who alone recorded 85 of them). Among the Van Heusen hits featured in this final Songbook Summit program were Love and Marriage, High Hopes, Like Someone in Love, It Could Happen to You, My Kind of Town, Here’s That Rainy Day, and, in a terrific finale, Come Fly With Me. The film clips that accompanied the musical program were also remarkably enlightening, including shots of characters as disparate as Bob Hope and Bing Crosby; the members of the “Rat Pack” (Sinatra, Dean Martin, Sammy Davis Jr., Peter Lawford, and Joey Bishop); Groucho Marx; Bette Midler; Willie Nelson; and Johnny Carson. The 2018 Songbook Summit may be over but the Anderson twins are planning a similar program for next year devoted to four other renowned American composers (individual selections have not yet been made). I, for one, am eagerly looking forward to it.